• Videos We are now collecting videos on their own page. The best way to ‘get’ TouchDrawing is to see it! • Eyes of the Soul: My Life with Touch Drawing The story behind Touch Drawing and it’s emergence. • The Long Dance Story This link takes you to a page with several articles about the ceremonial dance form that Deborah has been involved with since 1977. It informs her teaching and music. Deborah occasionally introduces groups to a short version of Long Dance. It is now integrated into the Touch Drawing Gathering. • Art Therapy in Healthcare, a comprehensive Anthology edited by Cathy Malchiodi. Deborah contributed a chapter, Beyond the Patient Art and Creativity for Staff, Management, Executives and Organizational Change. She draws upon examples from her long-term collaboration with Kaiser Institute, a medical organizational consultant group. Note: The pdf is a manuscript version without images. Buy the book to see the finished chapter. • Feminine Mysticism in Art – Artists Envisioning the Divine, compiled and edited by Victoria Christian. Deborah’s contribution, A Feminine Path in Life and Art is on page 141-145 of this chapter download, Rebirth of the Great Goddess. • Featured alumni in Alma Mater, Cooper Union’s newsletter. Interview temporarily unavailable. • HeartWisdom Radio Now A dynamic conversation with Jonathan Stemer. Listen here. • A deep and resonant conversation with Christine Upchurch on her radio show. Scroll to the May 31 interview. • Wise Woman Radio Interview with iconic herbalist Susun Weed. Deborah and Susun have a great time talking together! Listen or download here. 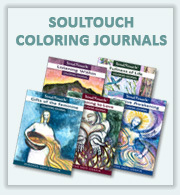 • International Creative Art Therapies Teleconference Deborah talks you through an imaginal experience of doing Touch Drawing in this interview. Listen here. • Art and Soul Radio Interview with Catherine Foster and Sheryl Allen Download the MP3. • Layers of Health Interview with Nina Wallinder Download a transcript to read or an MP3 to listen. • THE ART OF GRIEF – Using Expressive Art in Grief Groups by J. Earl Rogers, Routledge Press. A collection of alternative modalities of grief art therapy, packed with pictures, stories, and instructional detail. 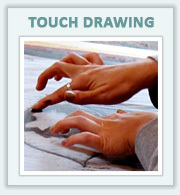 Read Deborah’s extensive section on Touch Drawing. • The American Holistic Nursing Association Journal Beginnings article titled Creative Expressive Arts in Nursing written by Eileen Zorn about her collaboration with Deborah, using her live drawing in deep visioning retreats for hospital executives and managers. Download the article with drawings. • An interview with Deborah by Danny Hobson of The Arts & Healing Network Deborah shares her thoughts about the healing power of creative expression. 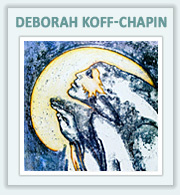 • From Paper Towels to SoulCards An Interview with Deborah Koff-Chapin by Dr. Cat Saunders. • The Discovery of Touch Drawing Autobiographical article by Deborah Koff-Chapin. • The Story of SoulCards as told first by Deborah and next by Will McGreal, the first user of SoulCards. • Why SoulCards? 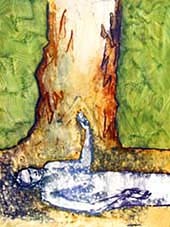 Goodbye Yellow Brick Road SoulCards ability to empower the self by Will McGreal, the first user. • Transforming The Myth; Making a Choice to Live Our Lives in Another Way by Deborah Koff-Chapin, Guest Co-editor of this issue of In Context Magazine on the theme of Art & Ceremony in Sustainable Culture. While growing up, I held the artist as my highest ideal. In living close to the source of creation, the artist was close to the heart of God. During the tumultuous upheavals of the sixties, my involvement with art served as a stabilizing element. While other teens were turning to drugs, politics or parties, painting was my alternative mode of ‘truth seeking’. It was a vehicle for turning inward and realizing the companionship of solitude, as well as a means of communicating from the depths of my soul. My natural tendency was to reflect states of being through the human image. Once, frustrated by the authoritarian attitudes at high school, I went home and painted a giant red face that filled the canvas with great power and authority. It was a way to release my anger and make a statement that communicated my feelings in a universal form. Sometimes I would go into the woods, soak up the peaceful atmosphere and let an image surface into my mind. I would pour this out onto the canvas in one intense stream of effort. It felt as if the image had a life of its own. There was magic in these moments, a feeling of having helped God in the act of creation. Upon graduating from high school, I attended art school in New York City. I enthusiastically leaped into the mystique of the art world, but existential nausea set in as I began to question the meaning of art. The human form disappeared from my paintings. As brushes began to feel like obscure instruments, I turned to pouring and dripping paint. I read art journals and learned to verbalize the concepts behind the work I saw in contemporary galleries and museums. “Art talk” became the high craft. One day while on retreat in my school’s country campus, I came across a willow tree swaying gently in the breeze. The tips of its branches were etching lines in the sand below, creating ever-changing patterns on the beach. Ecstatic at the sight, I realized that I was witnessing the pure, unselfconscious act of nature drawing. I took a role of photographs and thought no more of it. In retrospect, I have come to recognize my joy in this experience as a sign of my underlying search for a more natural way to draw. By my last year in art school, I had become fluent in the language of abstraction. It was pure and essential, but foreign to the eyes of all but those educated in the ‘esoteric knowledge’ of the art world. I was stunned into this realization one day when an old friend came to my studio and stared blankly at the paintings on the wall. I used to share the depths of my soul with friends through imagery. Where had I gone in those years to draw such a blank? The seed of an answer came one day as I scribbled some words onto a page…“What’s wrong with drawing a face?” With a shudder of guilt, I tentatively doodled some raw, primitive faces. Feeling as if I had drawn something ‘dirty’, I tucked the embarrassing doodle away. Within a few weeks the seed that had been germinating in my being burst forth. On the very last day of my last year in school, I was helping a friend clean up in the print shop. As I placed a paper towel over an inked glass sheet, I felt an impulse to stop my intended motion. Instead of wiping, I playfully moved my hands on the paper towel. As my fingertips made contact with the paper, I felt as if I was blasted open. Thunderstruck, I lifted the towel off the ink and saw impressions that had been transferred to the underside by the pressure of my touch. Lines coming directly from my fingertips! I laughed ecstatically with this discovery. In a state of revelation, I moved my fingertips on one paper towel after another. The marks that were created through the pressure of my touch were so pure and natural. Like the willow in the sand, they were an extension of my being on the page, a record of each moment as it passed. Soon I realized I could draw faces – child like, simple faces. One after another, imprints of my ever-changing self poured through my fingertips and onto the paper. My soul was being reflected before me – raw, honest and direct. Although this experience appeared to be one of childlike play, underneath I felt something profound. I sensed that this was an evolutionary creative process that was intended to emerge into the collective in the coming years. I had received a calling to share Touch Drawing with the world. In the following weeks and months, I poured my soul into the process. It became my grounding point during a personally tumultuous time. Whenever I felt pain, fear or confusion, I would turn to the drawing board to express my feelings. In releasing an emotion onto the paper, I would be transformed into another state of being. I would then transfer the sensations of that moment onto another page. Each drawing was a stepping-stone deeper into myself. At the end of a drawing session I had created a series of images that externalized my process. I could then step back and witness my transformation. It was as if I had been sculpting my own psyche. I was deeply alone in my newfound creative energy. My work was my only source of grounding and stability. One day, I was walking along the streets of New York City in the stimulated yet unstable state I had come to be identified with. This all fit in very well with the artistic myths I had learned during my years in school. Suddenly, gently, powerfully – a single word floated into my mind – “Health”. This one word melted my culturally formed images of the ‘lonely tragic artist’. The sense that came was that the natural world is essentially healthy, and it embodies truth in its very being. If I was to find a way of truth in my work and life, I had to align myself with the health and connectedness found in nature. I thought of artists from other times and cultures – indigenous artists and the artists of the orient. They were grounded in their communities, tapping their creativity without the cultural isolation and psychological imbalance of so many artists our society held in esteem. In those moments my vision expanded beyond the paper to include the creation of my life as a whole. I realized that I would have to find another way to be an artist. I left the city and began to find kindred souls who, each in their own way had outgrown the cultural norms. Over the years I found ways to share my images in settings where they were seen not as commodities for sale, but as integral components of deep collective experiences and sacred processes. I have been blessed to feel embedded in the simple beauty of loving friendship and community. Even in my most private moments, I now know I am part of the web of life. The primal and therapeutic experience of those early days of Touch Drawing gradually evolved. I found myself drawing more from a sense of stillness and interior attention. The images began to feel like they were coming through me rather than from me. They developed an archetypal, transpersonal quality. Moving my fingertips on the page, I translate this subtle kinesthetic awareness into the language of human form. When I rise to leave the drawing board, I recognize that I am disengaging from a deep communion. Silently, I offer my thanks. By the early ‘90s, my drawings had blossomed into fullness with color and refinement of form. The seed had grown into a tree and it was now weighed down with over-ripe fruit. It was time for the images to find their way out to a greater audience. How could I make them more broadly accessible and yet maintain their purity? Upon the suggestion of a friend, I decided to see what my images would look like as a deck. I photographed about 150 of them. Through a series of synchronous events, the first person I shared them with was Will McGreal, whom I had just met. As he perused the photos, his jaw dropped. “This is just what I’ve been looking for!” he exclaimed. He told me he was a Tarot reader but had given away his deck that morning with the intention of never doing readings again. I gave him the stack of prints and asked him to let me know if they worked as a deck. “Two years a go I met my soul partner. We found a harmony and joy I never thought I could have with another person. Two months after we married he had a grand mal seizure. The doctors discovered a malignant tumor deep in his brain, saying he had at most five years to live. Our joy and exuberance was paralyzed and we spent a year fighting the cancer and the agony of lost dreams. Recently, I realized we have been handed a very unusual gift. We are now learning to slow down, listen to the inner voice, get back that joyfulness and feel our connection. Two weeks ago, I attended a seminar with Christina Baldwin. She asked each of us to select a card (face down) and write the inner dialog. I selected this card. When I went home, I purchased a deck for myself, shuffled them and drew the same card once again. Sometimes the negative energy from the tumor consumes us. It’s then that I look at my SoulCard. I see my message so strong and clear and I know why I drew this card twice. I will continue to use my SoulCards as a conduit for those inner and external voices.” SoulCards have entered the collective psyche and are living a life of their own. It feels as if they are no longer my personal images. 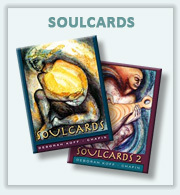 Many of the images in SoulCards were created very slowly, by rubbing layers of color onto a single page. Recently, I have returned to a more spontaneous approach once again. I also find myself more energized when working in relation to others. When attending a lecture or concert, I bring my materials and set them up in an out-of-the way corner. As I listen, I translate what I hear and feel into images. The speed of Touch Drawing allows me to create multiple drawings concurrent with the presentation, reflecting the flow of its content and mood. When I go for a walk in the forest or on a beach, I often bring my drawing materials. Inner and outer images merge to reflect the psyche as integral with the natural world. Images can serve the sacred life of the community. A beloved friend had been diagnosed with a brain tumor. She used it as a catalyst for awakening. After three years, she slipped into a coma. Remaining in her home, she was cared for by the community through the process of dying and beyond. Her husband shared that “the resonant and sensitive presence bubbling through the drawings added a tender, healing dimension to the whole community. The vivid images of heart-and-soul-opening perspectives brought all who saw them into an awe-full place of receptivity. That’s a very community-coalescing gift of Art, and the more so for being a spontaneous, immediate process.” This is the pure and original role of art. It is a great blessing to serve in this way. Although the focus of this writing is on my own work with Touch Drawing, much of my life has been committed to spreading the seeds of Touch Drawing to others. My original sense of its great potential is confirmed each time I see people diving inward through the mirror of the drawing board. Their hands dance on the page, unleashing natural healing forces. Over and over I am touched by the transformation people feel as they open the creative portals of their souls. A sense of deep fulfillment takes hold when they recognize the beauty, power and authenticity in their drawings, and recognize this as a reflection of themselves. I can’t possibly reach all those who might benefit from Touch Drawing on my own. Because of this, I encourage people to pass it along to others in their own way. In recent years, Touch Drawing has sprouted up in a broad range of settings. It is used with at-risk youth, people with AIDS, depression, cancer, sexual abuse, and stroke. I recently had the honor of introducing it to Palestinian therapists who work with children in the refugee camps in Gaza. Touch Drawing helps experienced artists to draw from a deeper source, and ‘non-artists’ find their way to authentic creative expression. Touch Drawing is so simple and natural. It is accessible to all. In opening a way for people to give birth to images directly from within their bodies and souls, Touch Drawing is aligned with the rising of the feminine principle. It also is a counterbalance to the technological forces that are overtaking so much of contemporary life. Touch Drawing evokes our ancient roots in the handprints on the cave walls, and looks ahead to our evolution as multi-dimensional beings. May it serve the healing of the soul and the growth of a vibrant humane culture on the planet, in ways as yet to be imagined.